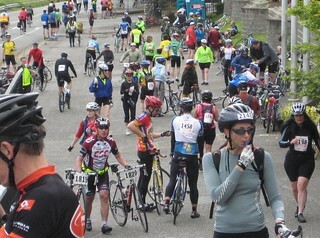 It might not feel like summer yet, but a couple of summer bicycling events are on tap this weekend in the Seattle area. The 3-day Evergreen Mountain Bike Festival gets underway this evening with its volunteer recognition celebration at Duthie Hill Park. The mountain bike event continues all-day Saturday at Duthie and Sunday at Black Diamond. 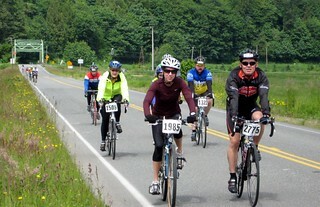 Then on Saturday, the Flying Wheels Century takes a flying start in Redmond. The Flying Wheels, presented by the Cascade Bicycle Club, is regarded as the biggest century bike ride in Washington state. Bicycling loops of 25, 45 and 65 miles also start from at Marymoor Park in Redmond and wind over the hills and through the scenic valleys to Issaquah, Carnation and Fall City. Only a “few showers” are called for in Saturday’s forecast. While cyclists might avoid getting wet, it would be a good idea to carry some raingear, especially as temperatures won’t reach the 60s until late morning or early afternoon. I did my first Flying Wheels here when I was fresh from Texas. The light jacket I carried wasn’t up to the job when a cold shower swept over us later in the century, and I was still shivering by the time I returned to the finish. Online registration for the ride is closed, but you can still register at the event between 7 and 10 a.m. Saturday. Cascade members enjoy a $4 discount from the $45 price. The Evergreen Mountain Bike Alliance festival gets underway Friday with a free volunteer recognition ceremony. As with any nonprofit, volunteers play a big role at Evergreen. We should all appreciate the great work they do in maintaining the trails in the Puget Sound area. On Saturday, the activities at Duthie Hill Mountain Bike Park in Issaquah include the Duthie Dash cross-country time trial race (8-10 a.m.) and a dual slalom race from 10:30 to 12:30. Also, there are free bike demos all day, on- and off-bike activities for kids, a beer garden and product booths. On Sunday, the festivities move south to the Summit Ridge Bikepalooza in Black Diamond. A 6- and 10-mile cross-country poker ride is featured along with a technical skills challenge. There also will be booths, demos, food, beer and activities for kids and the park is open for riding all day. Both days are free for visitors, but competitors will have to register. Checking the BikingBis ride calendars for Washington state, I see the Painted Cyclists are scheduled to make an appearance next Saturday (June 16) at the annual Fremont Summer Solstice Parade. They’ll definitely want sunny, warm weather for that ride. Also, June Weatherill Cycling Classic is next weekend (Saturday) in Walla Walla, and the Loreen Miller Bicycle Ride in Spokane is that day also. Mass bicycle rides also are scheduled in California throughout June, as well as Oregon.